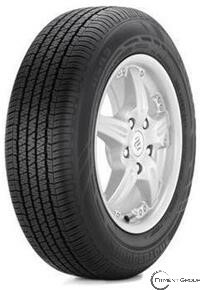 The Ecopia EP02 is one of Bridgestone's ecologically oriented, ultra-low rolling resistance Passenger Summer tires* specifically developed to match the Original Equipment (O.E.) needs of Toyota RAV4 EV plug-in electric vehicles. Because it is specifically designed for a unique purpose, the Ecopia EP02 is not intended to be used on non-electric powered vehicles. The Ecopia EP02 is designed to accommodate dry and wet conditions, but like all summer tires is not intended to be driven in near-freezing temperatures, through snow or on ice. The Ecopia EP02 combines traditional energy efficient tire technologies (low rolling resistance tread compound, narrow tread width, shallow tread depth and optimized internal construction) to maximize the Toyota RAV4 EV's efficiency and driving range. *NOTE: The Ecopia EP02 Passenger Summer defaults to the Passenger All-Season tire category because there aren't enough Passenger Summer tire models to support a performance category.